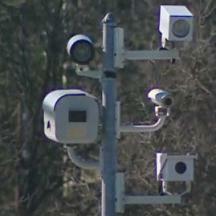 An investigation by WTOP revealed that a District of Columbia speed camera is actually located inside Maryland. The camera, located at the convergence of East Capitol Street, Southern Avenue and Central Avenue, is actually located about 20 feet inside of Maryland, near the Capital Heights Metros station. Both a speed and a red light camera are located at this position. The camera can clearly be seen sitting outside the "Welcome To Washington, DC" sign. ...And apparently because everything the government does is legal according to the government. However independent attorneys told WTOP that the camera appears to violate DC's own statute, which says the location of the hardware must be inside DC. "There are several statutes on this issue. But they all discuss automated traffic enforcement units in the District. That's the phrase: 'In the District.' So the cameras are placed in Maryland illegally," says lawyer Timothy Leahy. "D.C. statute 50- 2209.11 states that 'automated cameras "should be deployed in the District"' ... To put them in Maryland is illegal. The District can try and explain this away, but it's supposed to follow the law," says lawyer Paul D. Hunt. WTOP proposed that individuals who receive a ticket from this camera can attempt to dispute it at the DC-DMV, but notes that the hearing process seldom allows any defense regarding a system wide issue. "You would go before a hearing examiner and make the case that the system is deployed in Maryland. This counsel thinks your defense will be denied at the earliest stages because they're not going to make a pronouncement about citywide policy. So you'd essentially have to go through a long road to the D.C. Court of Appeals before a decision was made," Hunt says. Attorneys WTOP spoke with noted that the process to force the city to move the camera would be extremely expensive: "Unless you can do it yourself as a lawyer, you're talking about 100 hours of legal time and could spend as much as $20,000 with no guarantees of success over a $100 ticket," adds Hunt.